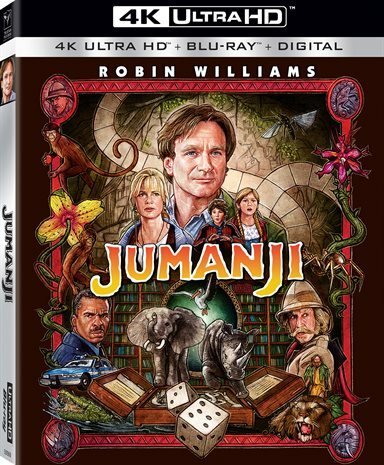 Jumanji gets an update this month while Sony celebrates the 20th anniversary of the original with a 4K UHD Blu-ray release. Imagine being a nine or ten-year-old boy who is bullied at school and who is so afraid of his father that he lets a good man get fired for a mistake he made. For Alan Parrish (Robin Williams; Mrs. Doubtfire) this is his reality one day in 1969. As he contemplates running away from home, his fate is decided by another turn of events that finds him being "sucked in" to a board game for the next 26 years. As Sony Pictures is set to release an updated version of the 1995 movie Jumanji later this month, it seems only natural that the original film should return to stores now on 4K Blu-ray so we can reacquaint ourselves with the original while experiencing it in an updated format. As mentioned, Alan took a shoe from his father's factory and broke one of the machines getting Carl (David Alan Grier; In Living Color) fired for his mess. Alan then finds an old board game while attempting to run away and begins playing it with his best friend Sarah (Bonnie Hunt; Life with Bonnie). Suddenly things take a dark turn and Alan gets "trapped" inside the game. Fast forward 26 years and Judy (Kirsten Dunst; Spider-Man) and Peter (Bradley Pierce; Beauty and the Beast [voice]) find the old, magical board game in the attic of the house they live in with their Aunt Nora (Bebe Neuwirth; Cheers) after their parents passed away. Playing the game frees a now adult Alan but still "traps" the three of them into playing. They also must find the equally adult Sarah and include her in the quest to finish and, more importantly, win the game. The majority of the film is them then taking turns rolling the dice and seeing what evil things are released by Jumanji. The only way to finish the game and set everything back to the way it should be is to win, a task that seems increasingly unlikely. I'm a huge Williams fan so I enjoyed him in this role, though not as much as some of his others. Hunt compliments Williams nicely and the two play off each other well. Dunst and Pierce have an easiness that would make them believable as siblings. Grier is terrific in his smaller role and honorable mention goes to Jonathan Hyde (The Mummy) as the hunter Van Pelt (and briefly as Alan's father). Overall, the cast help make this movie better than it might otherwise have turned out. Based on a 1980's children's book, the story is a little problematic. While the concept is great, interesting and somewhat unique, the execution is a little lacking. The story/screenplay has too many "what ifs" to be remotely realistic (although, I'm sure a game board coming to life is the least realistic thing one can imagine). There is a domino effect to this film and if one piece doesn't fall exactly right then the premise of the movie makes no sense. Having said that, it does manage to hold the viewer's interest much of the time. The 4K UHD Blu-ray, presented in 2160p high definition video with a 1.85:1 aspect ratio, is the best quality ever produced of this film. While moments seem a little blurry, the colors are bright and full. The Dolby Atmos audio gives the movie a nice boost especially when the African drums are beating. The special effects are rather lame which is only sharpened by the upgrade of the video quality. The Blu-ray set includes several special features including Special Effects Crew Commentary, Jumanji Motion Storybook, Behind the scenes featurettes, storyboard comparison, Extreme Book of Nature, episodes from Jumanji: The Animated Series, and the original theatrical trailers. There are also new features including a sneak peek of Jumanji: Welcome to the Jungle, deleted scenes and a gag reel with the brilliant Robin Williams and other cast members. Even though the movie is based on a children's story, it seems too scary for young people. It's not for the easily scared but if you stick with it, it will be worth the ride. Download Jumanji from the iTunes Store in Digial HD. For more information about Jumanji visit the FlickDirect Movie Database.